Snooper Ventura S6800 Pro caravan sat nav features a large 7-inch slim wide touchscreen. Featuring a database of 20,000 campsites across 31 European countries the Ventura S6800 has Bluetooth capabilities for handsfree calls and it also provides TMC Traffic information. The S6800 also includes a Tyre Pressure and Temperature Monitor. Snooper S6800 Ventura Pro features Lane Guidance and Junction View to help guide you along your route with turn-by-turn voice directions. The Ventura S6800 Pro also has My Speed speed limit alerts for every road and optional speed cameras. Snooper S6800 Ventura Pro Europe has been discontinued. Accessories and spares for the Snooper S6800 Pro can be purchased here. View the latest range of caravan sat navs. Snooper S6800 Ventura Pro is a portable 7-inch satellite navigation system which has been designed for caravanners and motorhomers. ‣Snooper S6810 Bus & Coach - for drivers of coaches and buses. ‣Snooper S6810 Truckmate - for drivers of trucks, HGV's and oversized vans. 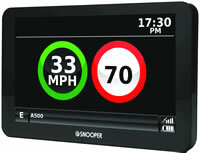 Please note: All of the above Snooper S6800 models feature a car mode. The S6800 Ventura Pro features a large 7-inch screen which is touchscreen, is Bluetooth enabled, uses the latest here European maps and includes built-in FM transmitter. Pressure: Always see the tyre pressure of you vehicles tyres on screen on the S6800. Also receive an audible alert when pressure decreases. Temperature: Always see the temperature of your tyres on screen on the S6800. Also receiver an audible alert when the temperature of your tyres rises. The S6800's My Speed XL feature lets you see the speed limit of every road in a large format on the 7-inch screen of the Snooper S6800. It will display speed limit and current speed helping to protect your licence. 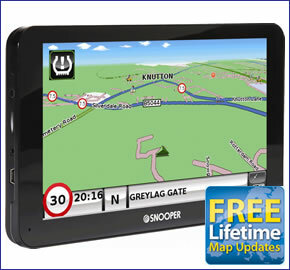 If you would like a sat nav system with a DAB Digital TV then we recommend buying the Snooper S8110 Ventura. S6800 caravan sat nav also provides advanced warnings to roadwork's, congestion and traffic jams and what's more these alerts are all FREE. The S6800 Pro Sound features TMC Traffic information which utilises the traffic master information network. SPECIAL OFFER: Buy the S6800 Ventura Pro Snooper caravan/motorhome satnav model fromActiveGPS and receive FREE lifetime map updates worth over £100. Theannual road map updates are by here. Details of the offer and other models that include the FREE lifetime map updates can be found here. Snooper Ventura S6800 sat nav calculates your route for your caravan or motorhome based upon the dimensions of your vehicle (height, width, length and weight). Simply enter your vehilces dimensions and it will provide turn-by-turn navigation to your destination avoiding height and width restrictions, e.g. low tunnels and narrow roads, etc. The Snooper S6800 Ventura features a database of 20,000 campsites throughout 31 countries. These campsites are provided by The Caravan Club, The Camping and Caravanning Club, ACSI, BordAtlas and Facile En Route. This database is searchable by facilities such as whether there is a swimming pool, watersports, by the coast or a river, nearby shops and restaurants, etc. Some of the campsites also show a photo on the units screen before you set off. The Snooper Ventura S6800 Pro satnav also features Junction View and Lane Guidance. These two features help to make it clear which lane you need to be in at each junction providing you with plenty of warning. To make your current location clearer and to highlight where you are heading, you can also increase the size of road names and numbers displayed on the 7-inch screen. The Ventura S6800 has a point of interest (POI) 'corridor' search which will inform you of points of interest along your predetermined route. Additionally the Ventura S6800 sat nav system includes petrol stations POI so you can find the nearest one to you or in a pre-defined area. There is also a route timer that can be set to alert you when it is time to take a break on your journey so that you do not risk falling asleep whilst driving long journeys. There is a car mode in the Ventura S6800 Pro so the system can be used in a car on its own instead. The S6800 Ventura includes My Speed information meaning it will tell you the speed limit of every road regardless of whether there is a speed camera or not. You can get speed limits for towing vehicles or Motorhomes. The Ventura S6800 will also alert you if you exceed the speed limit protecting your driving licence. There is also an optional AURA speed camera database. The database provides advanced warnings to both fixed and mobile speed camera locations across the UK, Europe. Click here to read more about the AURA speed trap database. Snooper S6800 Ventura Pro mounts on the inside of your vehicles windscreen using the suction cup windscreen bracket provided. Snooper S6800 Ventura Pro can be powered directly either from its internal battery if it's fully charged or powered from the cigarette lighter socket. Snooper S6800 Ventura Pro provides advanced warning of all fixed speed cameras, SPECS and many laser sites using Snooper's AURA speed trap database. There are 3 easy ways to pay using a credit or debit card. The Snooper S6800 will only operate on Windows computers. Specifically, you must be using Windows 7, Windows 8, Window 8.1 or Windows 10. Additionally the software will only work with Internet Explorer 6 or Netscape Navigator 6 or above. Please note: The Snooper S6800 is not compatible with and will not operate when using earlier Windows or Apple Macintosh operating systems. The Snooper S6800 Ventura comes supplied with everything you need to use it in your car (see What's in the box? above), however replacement and additional S6800 accessories are also available to buy from ActiveGPS. Parts available include: carrying case, hardwire power cable, windscreen suction cup mount, AC mains charger and vehicle charger with TMC antenna. Question: I have a snooper s6800 ventura pro but cant update it. I am currently running windows 10 64 bit. Unit says unrecognisable. map updater wont open. Any ideas? Answer: To answer your technical query please contact Snooper technical support on 0333 121 2252. While we retail Snooper sat navs and accessories we do not sell or have any involvement with the maps. Do you have a question about the Snooper S6800 Ventura? Submit your question via our contact page.